Helena Athletic Club almost always has openings for enthusiastic individuals who love to hang out and play with kids! Whether it’s in the Gymtrix area as a preschool and rec. 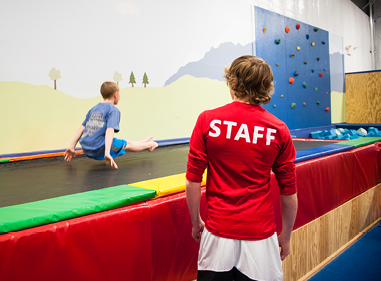 coach, working with our competitive cheerleading and gymnastics athletes or leading a preschool or after-school group in the Tree House Learning Center our company has plenty of opportunities for all. Paid training, on-the-job shadowing, paid credentialing and continuing education are just some of the professional perks of working at HAC. We also offer complimentary classes and programs to our staff and their families plus company sponsored benefits after one year of employment. Join our team today! Students under 18 years of age should print off the application here. All other applicants should submit a cover letter and resume to [email protected].